This is our classic rosewood gift box collection. 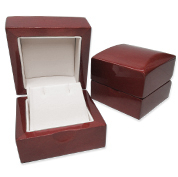 This style comes in ring boxes, earring boxes, bracelet boxes, pendant boxes, necklace boxes and more! Feel free to browse the rest of our wholesale jewelry boxes! Thank you for shopping at Jewelry Display Online!